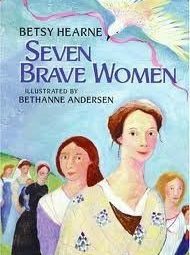 A children’s book, Seven Brave Women (Greenwillow Books, 1997) is based on the author’s grandmothers and mother, each woman strong and individually unique in her own right. In her introduction, Dr. Betsy Hearne, a writer and teacher of children’s literature on the college level, notes that “In the old days, history books marked time by the wars that men fought.” But where are women’s voices and experiences between the Revolutionary War and the Vietnam War? Not in our history books. Hearne, by using the stories her mother has told her — the “her” stories of her grandmothers and beyond — brings to life the voices of the women who “lived during [the wars], but did not fight in [them].” From her great, great, great-grandmother Elizabeth, a Mennonite who traveled from Switzerland to Philadelphia in a wooden boat with two children and pregnant with her third baby to her great-grandmother Helen, who became a doctor when only men dominated the field to her grandmother Betty, who attended architecture school, her all-male peers holding signs up to her that read “NO DOGS, CHILDREN, OR WOMEN,” Hearne pays tribute to seven extraordinary women in her own family’s history — but also during the wars that define American history from the male perspective. She does a beautiful job showing strength and bravery of women who lived during major wars and sacrificed their dreams and some even their lives in pursuit of their goals. These women are heroic in their own way, “unsung heroes,” as Hearne describes them, living during time periods that did not give women any credit for their lives. Through this book, Hearne gives a voice not only to the women in her family, but also to all women who have never been championed by history books. It is a wonderful book with which to show little girls the strength of women — some mothers, some doctors, some architects — but all women. This is a strength that today’s little girls do not see a great deal of, and these lessons in female potential and bravery need to be modeled for them. This book is a great place to start.